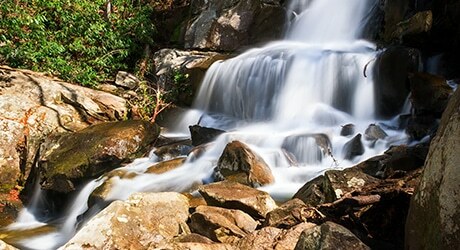 Take in everything that the Smoky Mountains has to offer on this is easy 2.6-mile hike to Laurel Falls. As you make your way to the falls you’re encompassed by the breathtaking geological formations. The paved hiking trail to the falls is the perfect starter trail for families with smaller children. Although paved, it is still wise to wear hiking shoes and avoid bringing strollers. Trail History: Laurel Falls Trail was built in 1932 to provide fire crews’ access to Cove Mountain in case a forest fire was to occur in the area. In 1935 workers also completed the Cove Mountain Fire Tower. The trail quickly became a frequent path for hikers and by the 1960’s the trail began to experience high levels of erosion, leading to the pavement of the Laurel Falls trail by the Department of Interior in 1963. Laurel Falls trail is the longest and most popular of the four paved trails in Great Smoky Mountains National Park. 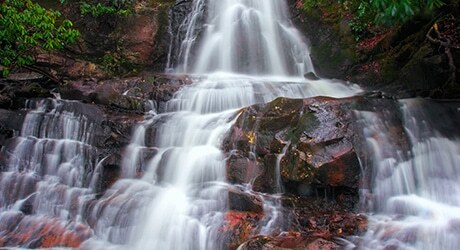 Hiking Laurel Falls: Laurel Falls is one of the most frequently visited trails in Great Smoky Mountains National Park. The name Laurel Falls comes from the evergreen shrubs (rhododendron and mountain laurel) that grow near the trail and waterfall. During a hike, you will experience vast greenery as you make your way toward the 80-foot waterfall that consists of an upper and lower section. The sections are divided by a walkway that crosses the Laurel Branch Stream located at the base of the upper falls. This trail makes for some great photography opportunities, so if that’s something you’re looking for plan to make your hike in the early morning or late in the day for the best lighting. The Laurel Falls trail surface is mostly paved as it winds up the side of the mountain. However, it is rough and uneven throughout the path. With short steep sections, the trail can be slightly dangerous in wet weather conditions so watch your step if you’re hiking in the rain. Portions of the trail also have steep drop-offs so wheelchairs and strollers are not ideal for the trail. Also, avoid climbing on rocks near the waterfall as many people have suffered injuries from the slippery rocks and algae that grow on them. Directions to the Trail: From Sugarlands Visitors Center, turn toward Cades Cove on Little River Road and drive 3.5 miles to the trailhead where there are parking areas on both sides of the road. Get out there and find what adventure awaits you on the Laurel Falls trail!